Castle Combe had a mixture of highs and lows on and off track that tested the resilience of team and drivers alike. Stephen Nuttall maintained the status quo of his position in the Supersport championship. DPR team drivers claim six of the top eleven places in race two. Top results for DPR workshop set ups in the non-team supported Academy and Roadsport grids. The first race saw the leading pack trade places throughout the first race but in the closing stages Stephen Nuttall made and held a break to cross the line one second ahead of the following pack with the added bonus of gaining the fastest lap in the race. Danny Killeen was 2nd and championship leader Jenkins crossed the line in 3rd. All of this hard work was put at risk by a track limits penalty that would have demoted Nuttall to 7th. However after a visit to the Stewards the penalty was rescinded by a unanimous verdict. The second race was just as close but this time it was Jenkins who claimed 1st and fastest lap. Nuttall preserved his championship position by stealing third from Killeen on the final approach to the line. Allowing for dropped scores, Nuttall is just two points behind Jenkins. Good results were claimed across the DPR team. R300 driver Matt Dyer returned to race in Supersport for the Castle Combe round only and gained a respectable 7th & 5th. Newcomer John O’Brien in the DPR Arrive & Drive hire car gained 9th and 8th and for race two was followed by the remaining DPR team drivers Nick Powell, Nick Portlock and Ian Sparshott allowing DPR team drivers to claim six of the top eleven results. David Webber’s two 2nd place results both with fastest lap strengthens his position for a championship challenge; the championship leader Paul Aram doing no better than 7th in both races. 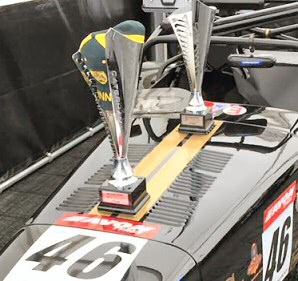 Both Rui Ferreira and Andrew Perry have extended their respective leads in the Academy Green & White Groups following their wins at Castle Combe. Rob Watts did well to claim 3rd place in the Green Group following a rapid repair to his car after an off-track incident at Combe in the previous week.